Norman Hardie knows the South Island mountains like few others. You can feel the intimacy he has for his mountains. It must have come as no surprise in 1956 when Norm was a member of a small party that did the first ascent of the world's 3rd highest mountain, Mt. Kanchenjunga. pictured below from Goecha La (4940m), Sikkim, India. The ascent of Kanchenjunga is an important part of the book and deserves such a well crafted section, but it is his raw love of the New Zealand Alps that makes the book a classic, and brings together the threads of tramping, hunting, culling, skiing, photography, climbing and his profewssional take on hydro electic generation. The cover of Norman Hardie's book On My Own Two Feet. There was an exceptionally good article on Norm Hardie in Saturday's Christchuch Press , which gave me permission to run it on my blog. His name is not one immediately associated with the world's high peaks, yet Norman Hardie is among the great mountaineers of the great age of mountaineering, writes PHILIP MATTHEWS. It's like the moon landings. Everyone over a certain age remembers exactly where they were when Apollo 11 touched down but no-one paid much attention to Apollo 12 or Apollo 13. So it is with mountains. You know who knocked off Mt Everest, but not K2 or Kangchenjunga. Which is why you probably haven't heard of Christchurch's Norman Hardie. In 1955, Hardie was one of the group that made the first ascent of Kangchenjunga. At 8586m, this is the third-highest mountain in the world, but it doesn't lag behind by much – its Himalayan neighbours Everest and K2 measure only another 260m and 25m respectively. But it's always about Everest, isn't it? The tallest, the most famous. The most glamorous. "Everest is nothing like the hardest, though," Hardie says. 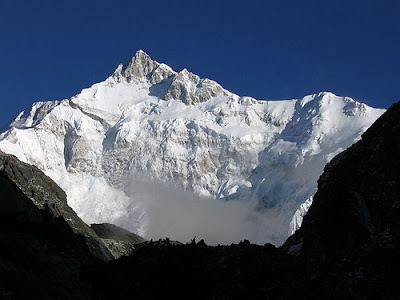 "Of the 14 mountains over 8000m, it ranks about 10th in difficulty. It's just the fact that it's big and has a pronounceable name, and particularly because the British began trying to climb it back in 1921. They climbed it on the 12th expedition. There had been masses of books about it and a hang of a lot of hype, especially in the English language." You won't hear it from him, but Hardie is one of the 20th century's great mountaineers. In the foreword to Hardie's 2006 memoir, On My Own Two Feet, Sir Edmund Hillary called him "a skilled mountaineer and a formidable explorer . . . renowned for his considerable determination and refusal to accept defeat". Michael Ward, medical officer on the 1953 conquest of Everest, called him "an outstanding mountaineer and surveyor, whose feats can be compared with those of Oliver Wheeler and Henry Morshead on Everest in 1921 and of Michael Spender in 1935". Even if those names mean nothing, you know that's heady praise. Surely there should be statues and plaques, perhaps streets named after him. But the lack of attention back home isn't a concern. "They make a fuss of me in Germany and Japan. And the British do, too. I've never been worried about it." Hardie is 83 now, officially a semi- retired engineer and living a quiet life in the hills of Cashmere. Where else would you find him in an otherwise flat city? Even the driveway is a perilous ascent. There is a sheer wall of mountaineering books and journals in his study, and a cluster of Nepalese artefacts. There is a view of the distant Southern Alps. There are photos from the last reunion of the Kangchenjunga party – of the original nine, only four remain. Among serious mountaineers, Kangchenjunga was seen as an enormous challenge and a glittering prize – definitely a tougher climb than Everest, Hardie reminds us. Earlier German expeditions had come within 1000m of the summit but were driven back by bad weather. But with oxygen tanks designed by Hardie, Joe Brown and George Band reached the top on May 25, 1955. Hardie and Tony Streather followed a day later. And it would be another 22 years before anyone else would match them. Their feat was even more astonishing when you consider that the 1955 expedition was only supposed to be a reconnaissance mission for the real effort the following year. It was another time, the closing of the great age of exploration. By the end of the 1950s, the world's major peaks had been conquered and much has changed since. Everest has become "a playground", some say, just another stop on the adventure- tourism circuit. Any would-be climber can buy the services of an experienced guide and pay their way up – New Zealander Rob Hall, a man Hardie knew well, died on the mountain in 1996 while looking after a client who had collapsed near the peak. Yes, the commercialisation of climbing is a concern. "It worries me because a lot of people have been to the top of Everest and never seen snow before in their lives. People from Hong Kong and Singapore. A woman from the Philippines got to the top of Everest last year. It cheapens the whole thing." Hardie served his climbing apprenticeship in the Southern Alps and first encountered Hillary there in 1948. It was the year of the famous Mt La Perouse rescue, when the injured Ruth Adams was carried down from the mountain in a stretcher. This has been called "the most arduous rescue in New Zealand's climbing history". That story is a reminder of just how tough our backyard can be. 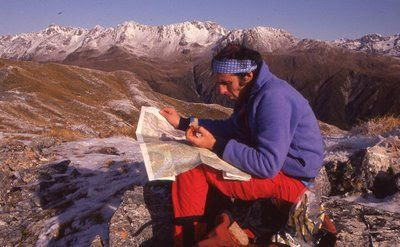 For years, Hardie was called on to help look for lost climbers in the South Island. He can still vividly remember the time he was caught in an avalanche on Mt Rolleston during such a mission. "Unconscious for a while there," he says quietly. "Thought I'd had it. Slowly going out as the oxygen runs out." The same avalanche took the life of his good friend John Harrison. The bodies of the four lost climbers they had looked for weren't found until months later. And that, he writes in his understated way, was to be his last high mountain search. As for putting it all down in a memoir, he says that he "got pressured from all sorts of people saying that my story ought to come out. The official book on Kangchenjunga – by Charles Evans – was the most restrained, controlled book I've ever struck. A very gentlemanly British thing that didn't give anything like the whole story." After Kangchenjunga he kept up a relationship with that part of the world. He made 14 trips to Nepal and only the first three were about mountain climbing. He spent 22 years as a director of Hillary's Himalayan Trust, helping to build schools and set up the Sagarmatha/Everest National Park. In 1960, he joined a team that had the very serious purpose of high- altitude acclimatisation research and another, more frivolous mission – to track the yeti. How seriously was this taken? "The American members of the party took it very seriously. There were 22 of us from four different countries. The American sponsors were concerned that the medical research wouldn't get any publicity so they talked Hillary into going along with looking for the yeti. All of us who had been there before were very cynical about this. But it paid for the expedition and everyone had a good time." And it might be a ridiculous question but was there any evidence? "There were footprints in the snow but they were just badly identified orthodox animals." He went south, too, making three trips to Antarctica over 20 years. Once to instruct Americans in the right way and wrong way to tackle snow and ice, once to join Hillary's party for the first ascent of Mt Herschel and once as leader of Scott Base. It was much harder then than now to make a living out of mountaineering. In the afterglow of the ascent of Kangchenjunga, that was something he had to consider. "Was I going to go a Hillary way and stay in this sort of thing permanently and somehow make money out of it? But I was already qualified as an engineer and decided to stick to that. "Once I started to establish myself, I got all these invitations to free expeditions. I never ever went on one that got paid. I had to be grateful for having a co-operative wife and a co- operative business partner – I was able to go away for so long and so many times. It's no good going to the Himalayas for a fortnight. You're pretty useless for the first two weeks." So bursts of adventure were slotted into domestic life. He had married Enid Hurst in 1951 and they had two daughters. He became a consulting engineer for a firm in Christchurch in 1956 and then a partner in his own firms. And until recently he was to be found kayaking and tramping around the South Island. Can a sense of adventure be genetic? You might ask this if you heard about his older brother, Jack. A quick search of Nelson newspapers shows that one Jack Hardie holds a record as the oldest man to have ever skydived at Motueka airport. It's become a tradition: every January, Jack marks his birthday with a plunge, as it coincides with the day that he was shot down over Holland during World War II. "The parachute saved him and as a result of that, he does this thing every birthday." In January, Norman and Enid will be in Nelson to watch Jack plummet out of the sky again, at age 90. Planes, mountains – Hardie has had something else on his mind lately, too. It's that great South Island subject: water. In 1948, as a young Ministry of Works engineer at Lake Pukaki, he had a brainwave. If the west coast of the South Island is wet, and the east coast is dry, why not pipe water from one side to the other? The idea hibernated for decades, but by the early 1990s, the surveying maps were accurate enough to see that the Landsborough and Douglas rivers on the western side are higher than Pukaki on the eastern side, meaning you could do it without pumping water uphill. Among his collection of geological maps, rain graphs and engineering drawings, he has some photos of the Landsborough Valley: the glaciers, the moraines, the boulders. "I began with the Landsborough because I knew it so well through mountaineering.. All the mountaineers and shooters who go in there know it's really wet and the river comes up pretty fast and stays up for a long time." It's entirely feasible, he believes, to put 25 kilometres of tunnels through the Alps and pipe the river water into Lake Pukaki. And as everyone who has spent a winter in Canterbury knows, the level of Pukaki and other hydro lakes are a matter of day-to-day anxiety. This could be a way to keep the levels up, without damming rivers and flooding valleys. As one Press correspondent wrote after reading about Hardie's scheme, "The forests and snails of the Copland Valley would be unharmed". It sounds ingenious. The Press understands that this idea was put to the old Electricity Corporation of New Zealand (ECNZ) in the 1990s and that there was some interest before the carve-up of ECNZ into Meridian, Mighty River and Genesis. So has it been on Meridian's mind again since? Spokesperson Claire Shaw says that while "it's a very interesting concept that we're aware of" and "there are clear benefits to the project for hydro storage in New Zealand", it comes with significant challenges as well. Quite a few of them, she says. "We have no plans to pursue it in the near future," she adds. "We have a whole host of options that would come before that." Too bad. In the meantime, Hardie's legacy can rest on his mountaineering exploits. It's strange to think of it, but in all these years he's never reflected on what makes a great mountaineer. Can he define it? He pauses and considers this for a while. "Fitness is obvious but you also need some appreciation of the high country, whether it's geology or weather," he says. "And certainly the ability to get on with people you're with if you're stuck in a small tent for three or four days." And presumably you need patience? "Yes. Yes. I believe too that you should never stick your neck out too much. Don't take too many risks. If the weather's not on or you're not feeling well or your climbing companion has bust his equipment, give it away. The mountain will still be there tomorrow." So I really am not going to say too much other than I think this track is great. Genuinely brilliant. Here is the track, I obviously shouldn't say anymore. Pain. What is it ? Pain, occurs on a physical, mental and spiritual level. I spent two years in 1985-86 living in the high Arctic regions of northen Canada and Alaska, eventually pushing for the north pole in 1986. It is only through pain, suffering and hardship that the human heart will be unlocked to greatness. Did I know what this Innuit proverb was saying ? I think not. At that stage I had experienced emotional and spiritual pain, but not weeks of raw, unending pain, that niggles and buries, never leaving you alone. And you would watch with serenity through the winters of your grief. Much of your pain is self-chosen. It is the bitter potion by which the physician within you heals your sick self. Conrad Kain - New Zealand mountaineer or world mountaineer ?. Mt. McKerrow, The Hopkins valley, New Zealand. Conrad Kain did the first ascent guiding Samuel Turner to the summit on 19 March 1915. Many plums were ripe for the picking and Conrad lead clinets up 30 first ascent in the New Zealand Alps. I was in touch with Mike Browne, of Fox Glacier, yesterday and he shared a lot of Govt files that he had recently come by him in his role as a founding member of the NZ Mountain Guides Association. 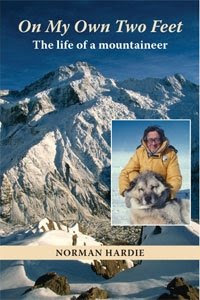 Good old Conrad Kain's name came up again on his sojourns in NZ as a mountain guide. The story is told in his book "Where the Clouds Can Go" He travelled to New Zealand three times between 1913 and 1916, where he guided 30 first ascents and climbed the country’s highest summit, Mount Cook, twice. His impact world wide was significant and I am just rereading his story in my copy of his book pasted below For so long we have taken Conrad as our own but he really was a Canadian based mountaineer who climbed extensively in north America, Europe and New Zealand.New Zealand mountaineer or world mountaineer ?. Conrad Kain in New Zealand. 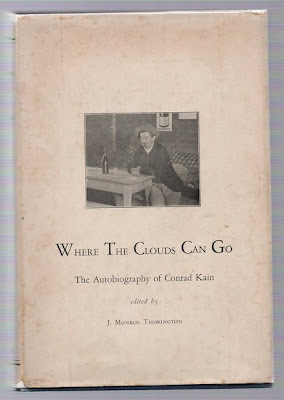 This is the first printing of WHERE THE CLOUDS CAN GO -- THE AUTOBIOGRAPHY OF CONRAD KAIN. It was published in New York by The American Alpine Club in 1935. This is the first and only printing of the first editon. The book measures 234mm tall x 16cm and has 456 pages, 29 b/w photos on 19 plates, index, with additional chapters by J.M. Thorington. Published posthumously (Kain died in 1934). A classic of mountaineering in Canada (250 pages on climbing in Canada). Kain, born and raised in Lower Austria, was a guide & great climber. He made around 100 first ascents & new routes in the Alps (mostly Dolomites & Gesäuse), New Zealand, & Canada including Mt Robson, Bugaboo Spire, & Louis. His three trips to New Zealand as a guide are quite remarkable between 1913 and 1916, where he guided 30 first ascents and climbed the country’s highest summit, Mount Cook, twice. in chapter summaries (Beatrice not listed at all, others as 2nd ascents). I find it interesting he guided Samuel Turner on the first ascent of Mt. McKerrow, named after my great-grandfather. Of his Canadian expliots, here is an extract from the Canadian Alpine Club. 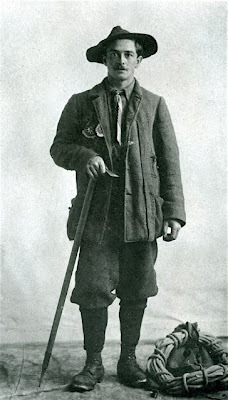 Conrad Kain, mountain guide (b at Nasswald, Austria 1883; d at Cranbrook, BC 2 Feb 1934). Kain received his first guiding job on a local cliff in 1903 and after 5 seasons of extensive climbs in the Alps was invited to become the first official guide of the ALPINE CLUB OF CANADA (1909), based in Banff, Alberta. Kain was an independent spirit, admired for his prolific climbing achievements and loved for his warmth and humour. In addition to guiding wealthy climbers in Canada and abroad, he was an assistant to early surveying teams at the Rogers and Yellowhead passes. He built the first ski jump in Banff (1911), ushering in the sport of recreational skiing, and led the first ascents of Mount Robson (1913) and Mount Farnham (1914), highest mountains in the Canadian Rockies and Purcells, respectively. Kain's 1916 ascents of Mount Louis, Mount Howser and the Bugaboo Spires involved climbing techniques that were ahead of their time and not repeated for many years. 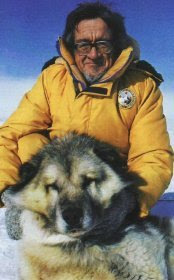 He settled in Wilmer, BC, on the edge of the Purcells in 1920, trapping in winter and guiding in summer. 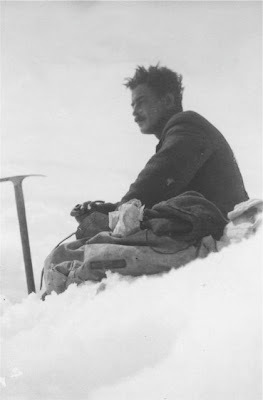 His solo snowshoe ascent of Mount Jumbo (1919) was the first winter ascent above 3350 m in Canada, and his last climb, in the Purcells, was of a 3352 m peak (1933) which later came to be called Mount Conrad. Kain died of encephalitis lethargica in hospital at Cranbrook. Look at those old knees ! I came home from hospital today after 10 days and nights. 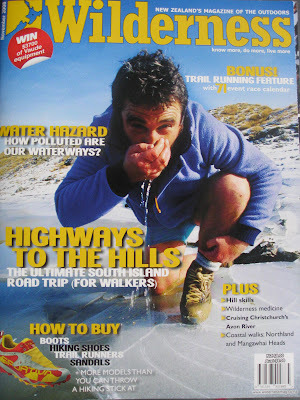 I think I could have coped with publicity about my new knees, but how I was I to know that the cover photo of this month's NZ Wilderness magazine, ( Nov 08) has a photo of me and my old knees taken in the Kelley Range, Arthur's Pass. in 1993, by Colin Monteath. Yes that's me on the cover taken 15 years ago. 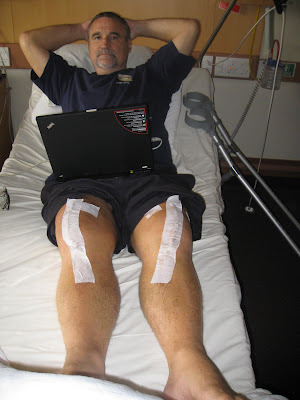 Compare it with my new knees below taken this morning just before I left St. George's Hospital in Christchurch. 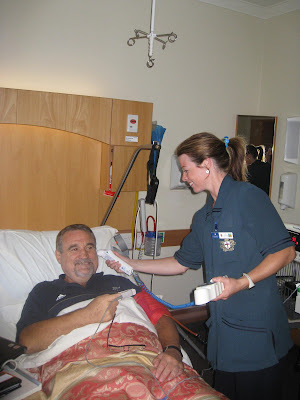 It is surgeon's like Ed Newman from Christchurch who has perfected these operations and dedicated nurses like Vic, above, who provide excellent after care, that makes it possible for broken-down mountaineers to regain quality of life. Under those 11 inch strips of tape which hide the scars and my new triathlon knees, is my hope for the future. Stryker Orthopaedics, the maker of the Triathlon Knee System, the industry's fastest-growing total knee replacement system worldwide. is now able to produce the highest possible quality knees, but you need the surgeons who can do the job and are able to select the right knee to meet your individual vision. Mine is to play football with the boys, walk freely in the hills again, and climb a small peak or two, or three. I want the quality of life back again. Thanks Ed Newman and team at St. Goerge's in Christchurch. I am working hard on the rigorous recovery programme that requires 5 training sessions a day. As I do this programme I am enjoying reading Steve Gurney's new book. Lucky Legs. Perhaps my next book will be Lucky Knees. I like the Swedish lady. I like her hair, too. I think it might be the antithesis of my own. My housemate has Robyn's telephone number. Not so bright after having surgery for bi lateral knee joint replacement. The pain was the worst I have ever experiened once I had to start walking on them the day after the operation. It is better now and I am making progress on rehabilitation. Aroha my daughter is on the right, there to comfort her Dad. FUTHER UPDATES ARE IN THE COMMENTS. Yay i juzz came back from the hospital and i'm going back to sckool WHOO HOO! And i bet everyone will play my croaches ad stuff hehe lols. Two Extrodinary long hours later of waiting we finally saw the doctor coming calling out ZHI MEI (my chinese name) and we were like yes thank God and we went in the torcher room again and the doctor wich is a she brought me to a bed and ask me qustions and tested my like see if its pain or not(it was). OWW!!! I SPRAINED MY ANKLE! Mad Dogs, mad artist and a walk along a beach. I go into hospital tomorrow to get two total knee replacements so I thought I would give my old knees that have served me so well over five decades, a last chance to walk me along a beach. I picked Sumner beach and went with Ruia my daughter, Deva her dog, and had a delightful outing. We had fish and chips on the beach as we watched people frolicking in the waves, kayaking in the surf, and others picnicking. Deva enjoyed chasing unreachable seagulls, fetching sticks and loved our fish and chips. Life is sweet. New Zealanders love their beaches and it was good to hear the laughter of children, feel the sun, wind and salt spray on my cheeks. It was a little nostalgic for me as this beach evokes so many memories. My Mother went to the School for the Deaf here and told me that as a child she would catch a train from Invercargill to Lyttleton, and walk over the bridle track to Sumner with her suitcase tied to her back by a rope. This was in the 1920s. She was a strong, sensitive and loving mother who brought us five children to have a love of the outdoors, walking and books. We never had a car when I was a child so Mum took me up all the local hills surrounding Dunedin: Mt. Cargill, Round Hill, the Soldier's monument perched on a spur overlooking the Otago harbour, Flagstaff, Saddle Hill and used to take me for long walks along St. Kilda and St. Clair beaches. Mum thought nothing of walking 15 km to see a relative on a Sunday and would relish the walk home. So her memory was with me as I walked yesterday. I thought we would cap the day off by visiting the man who wrote his auto biography,aptly named Mad Dogs. Robin Judkins, or Juddy, lives in an old two-storied house atop a hill in Sumner. He was delighted to see Ruia and I as he left his drain laying work and took us to the kitchen. For an hour we talked about politics, religion, love, life and family and then he took us out to see his new $5000 work of art, an outdoor glass table that was painstakingly made by artist Phil Newberg which he named Arrow River 2. Note the middle section of the table has been scattered iron pyrites by the artist. " It took four strong men to carry up the drive way to the back garden, " he proudly said. Robin Judkins (right) with his glass art table. I am on the left. 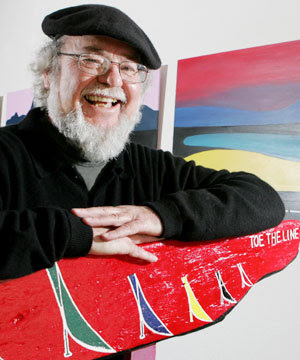 After his quintuple bypass operation on April 17, 2007 he started of examining a fairly bleak future.He soon came to the stark conclusion that he would turn his disability into his opportunity and on July 14 2007, he picked up his daughter Bonnie’s paintbrushes and painted “Iraq,” 39 years after he had painted a portrait of a girl he had fancied at University. 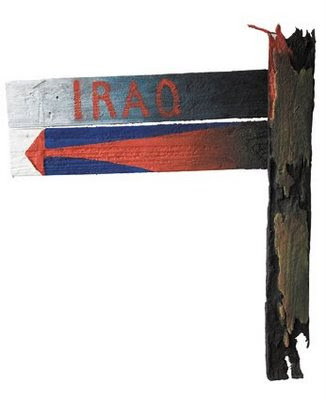 Iraq” took two days to draw and paint and then I couldn’t put the brushes down. Everything I looked at every piece of flotsam and jetsam took on a new meaning,” he said with intense passion. In Robin Judkins studio in Sumner. Robin on the left. Juddy and I go back a long way. I met him first when I did my first Coast to Coast in 1985 and after that we became firm mates. Just over a year ago his reply was, "yes, but just. I've had a heart quintuple bypass." 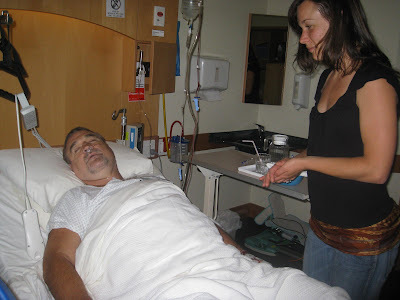 Juddy's determination to drink life to the lees, saw him slowly but surely recover. Some years back we talked for more than an hour about disabilities and how you need to turn them into opportunities. So tomorrow I will get that opportunity as I go under the knife to get mobility back into legs so I can stride strongly over the hills again, and climb the odd mountain. Thanks Juddy for your inspiration. It is a warm sunny day in Christchurch, New Zealand, the 15th of November 2008. I have been back in New Zealand for four days which has given me a chance to put together and publish a few articles I wrote when I lived, worked, trekked and climbed in Afghanistan in 1976, again from 1993-96 and visited in 2003-04 and 05. I also spent two years working in neighbouring Uzbekistan, Turkmenistan, Tajikistan and Pakistan and was able to visit the Afghan borders and look into Afghanistan and study the complexities of the mountain systems. See map of Afghanistan below. 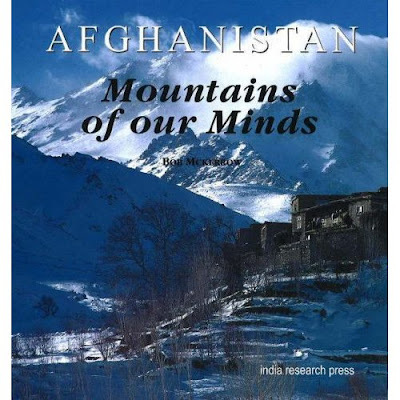 I hope this article adds something to the knowledge of the Mountains of Afghanistan. Writers and geographers have wrestled with descriptions and the location of the high Hindu Kush. It has been called the solar plexus of Asia, the Pamir Knot and in the second century was thought to be the source of the Nile by the Greek geographer, Ptolemy. Afghanistan is roughly quadrilateral in shape, with the long finger called the Wakhan stretching east wards. Afghanistan is a land-locked country lying between 29o 35' and 38o 40' northern latitude and between 60o 31' and 75o 00' eastern longitude on the mountainous and desert areas where the Iranian plateau borders with the mountainous systems of Central Asia. The system of folded mountains is quite complex and erratic, but generally run north-east to south-west. The north-east and central parts of Afghanistan make up a huge highland area covering over half the country with an average altitude of 2000 metres. The dominant mourn-tain system in Afghanistan is the Hindu Kush which commences in the extreme north-eastern corner of the Wakhan corridor and stretches in a south-westerly direction for more than 700 km finishing at the Shibar Pass. On the western side of the Shibar Pass the Kohi Baba curves south-westwards and can almost be called an extension of the Hindu Kush. This huge mountainous region descends on all sides quite abruptly to flatter regions, except to the north-east where it becomes the Pamirs. The boundaries of Afghanistan have changed dramatically in the last 200 years. At the start of the 19th century, Afghanistan stretched from Meshad to Kashmir, from the Oxus to the Satlej River and to the Arabian Sea. This greater Afghanistan was built by Ahmad Shah Durrani (1747-1773) and was known as the Durrani Empire. Unfortunately, the British colonialists in playing the great game and wanting to feed their politician's paranoia of the Russians, placed a buffer between Lahore and the Afghan border. The north-west frontier province was carved out of eastern Afghanistan and was incorporated it into the Indian Empire. In placing this formidable barrier between themselves and Russia, they left the highest peak of the Hindu Kush, Tirich Mir in India, now Pakistan. As most Afghans still regard everything in Pakistan's North-West Frontier Province across to the Indus as rightly belonging to them and knowing that the 100 year agreement (forced upon Abdur Rahman Khan in 1893) over the artificial border known as the Durrand Line has expired, they believe one day they will get back all their lands illegally seized by the British. The English explorer Colonel Schomberg describes the meeting point of the world's great ranges. "As the traveller climbs up to the passes on the frontier, he gazes over an expanse of snow and rock. To the east are the Karakorams, the Kun Lun, and the Himalayas: to the west and north are the Hindu Kush and the down-like windswept Pamirs. To the south are the great snow ranges of gilgit and Kashmir. He has reached the solar plexus of the mountain system of Asia, baffling and most repelleFor the purpose of defining the Hindu Kush, I use Moham-med Ali's definitions, the the Oriental Hindu Kush and the Occidental Hindu Kush. Mohammed Ali was a former Professor of History, Kabul, and a prolific writer of books on Afghani-stan. In deciding where the two divisions occur I amalgamate both Mohammed Ali's and Ludmig Adamec's dividing lines, the Khawak Pass. However Adamec goes further and divides it into three sections, the eastern from the Pamirs to the Dorah Pass, the central from the Dorah to the Khawak; and the western from the Khawak pass to the termination of the range near the Shibar Pass. Starting on the north-eastern extremity of the Wakhan corridor where the Pamirs abut from the north and the Karakorams from the south east, this is the meeting place of four countries: Remote, mysterious and seldom visited the countries of Tajikistan, China, Pakistan and of course Afghanistan meet. With its starting point in the Wakhan, the Oriental Hindu Kush con-tinues through Badakshan to the Khawak Pass in the Panjcher Valley, the graveyards of thousands of young Greek soldiers, who were led by Alexander the Great in the spring of 327 BC over the Khawak Pass. The soldiers died, frozen to rocks as they dropped from cold, exhaustion and frostbite. It contains the highest mountains in Afghanistan. Noshaq, 7485 metres is the highest point, of the Afghan Hindu Kush. In an area surrounding Noshaq are many peaks over 7000 metres. 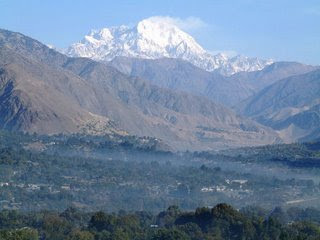 The highest peak in the south eastern limit of this Oriental Hindu Kush is Mir Samir, 5,800m, made famous by Eric Newby in his book "A Short Walk in The Hindu Kush," based on his eccentric journey in 1956 with Hugh Carless. Mir Samir is a magnificent peak, close to the Chamar Pass, and a two to three day walk from the Khawak Pass. I attempted to climb this peak in 1995 and climbed an unclimbed 5000 metre peak nearby.This is the upper part of the scenic Panjcher valley and contains the Anjoman Pass, 4200 metres which conects the Panjcher valley to Badakshan. This pass I have crosed four times and affords one of the most spectuacular views of the Hindu Kush, and the Tirch Mir can be seen in the distance in Pakistan. 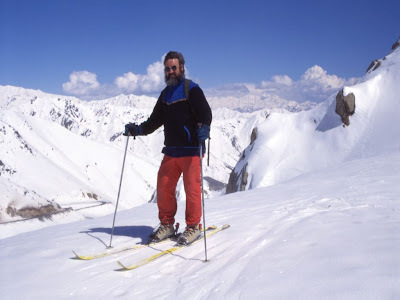 A subsidiary range runs south off the Hindu Kush into Nuristan and another to the north the Khuajeh Mohammad Range with peaks up to 5,800 metres. 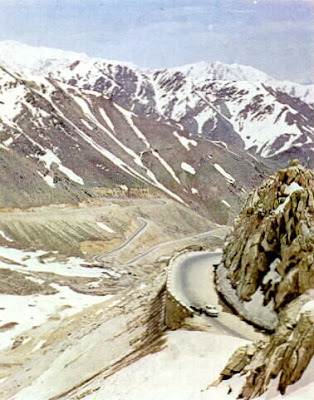 The western section of the Hindu Kush starts at the Khawak pass and continues another 200 km to the Shibar Pass in a south westerly direction. Halfway between the Khawak and Shibar passes is the Salang Pass and the Salang tunnel, supposedly the highest road tunnel in the world. There is no peak over 5200 metres in this section, but what it lacks in height, it makes up with spectacular scenery and hospitable mountain people, particularly in the lower Panjcher valley. The Hindu Kush occidental, was first named by Persians in their language of the Avesta, well before the coming of Alexander of Macedonia. They called it Paropanisadae, and means, a mountain loftier than the ceiling of even an eagle's flight. Alexander's men graecised it to Paropanisus. However it seems the Persian and the Greeks, were referring to the part of the Hindu Kush seen from Koh Daman, the plains north of Kabul, and is what we call, the Hindu Kush Occidental. The sheer size of the Hindu Kush is hard to gauge from a map. From 1993 to 1996 I criss-crossed the Hindu Kush countless times in the course of my work and the best viewpoint always was flying south to north over the Salang Pass at over 20,000 feet early in the morning. From the air, the Salang Pass appears in the middle of the mountain massif. To the north-east the Panjcher valley, narrow at the start and broadening later, dominates the low foreground. Thousands of peaks, increasing in height towards the eastern horizon dominate the jagged landscape. Two peaks are easily recognisable, Mir Samir on the southern side of the Panjcher and to the north, Kohi Bandak. As your viewing perspective nears the eastern horizon a jumble of indistinquisable high peaks merge into a mysterious white world. The width of the range is astounding, over 190 km including the subsidiary ranges. To the west the Hindu Kush diminishes in height and later merges imperceptibly into the Kohi Baba which in turns spreads in all directions into the wild and desolate tablelands known as Hazarajat. From the air the snowcovered tablelands look as though the concave mountain faces have been shaped by an ice-cream scoop. Standing alone to the west-north-west is the Turand-i-Turkestan, isolated. impressive and clearly separate from any other range, except for a spur running south-east, named the Hesar Range. Starting 25km south-west of Bamian, it extends in an westerly direction for 120 kilometres miles, curving like a boomerang. From the air its looks like an extension of the Hindu Kush with its highest peak Falodi 5135 metres prominent in the centre of the range. South and south west of the Kohi Baba is a very mountainous plateau area from which various tributaries of the Helmand river starts. To the north-west of the Kohi Baba is a mountain range from which the fist trickles of the Balkh River start. The peaks reach 4555 metres in height and appear from the air as a continumn of the Kohi Baba. The Kohi Baba is in the centre of a region that early Afghan geographers described as the Central Block of Hazarajat. A number of explorers and geographers have likened it to Tibet. Mohammad Ali's description cannot be bettered. "This is a vast table land extending from Herat to Kabul and from Ghazni to Bamian. It is a high, bleak, and intensely inhospitable country, where snow lies for a greater part of the year, and where little or no fruit is grown, and the cultivation is confined to the narrow banks of rivers and streams. This irregular table-land has been scored and eroded for centuries by river action. From here emerge some of the greatest rivers of Afghanistan. To the north the river Khulm (Tashqurghan) and the Balkh take a hurried start for the plains of Bactria; westward the Hari Rud streams off to Herat; south-ward extend the long curving lines of the Helmand, Harut, Khash Rud and Arghandab, and eastward flows the Kabul with its various branches. A rugged mountain mass, called the Koh-i-Baba and Firoz Koh, the lineal continuation of the Hindu Kush." The southern extremity of Hazarajat are Shah Massoud and Kafar Jar Gah ranges which run along the southern border of Oruzgan provinces. To the west of the Kohi Baba is a twin range named the Firoz Koh. It runs parallel to the Tir-band-i-Turkestan, which lies to the north. The northern branch of the Firoz Koh is called the Safid Koh (the white mountain) and the southern branch is called the Siah Koh (the black mountain) It lies within the Hazarajat region. The name Parapomisus is a confusing name and it pops up in history books going back as far as Alexander the Great. One writer says " Continuing meanwhile his own advance, Alexander arrived at the foot of the colossal mountain-barrier, the chain of the Paropanisos, which separates Kabul from Bactria. The natives designation was Parapamisos, or, as Ptolemy more correctly transliterates it, Paropanisos. "(J.W. M'Crindle) In the course of time this range gets shifted to the west. 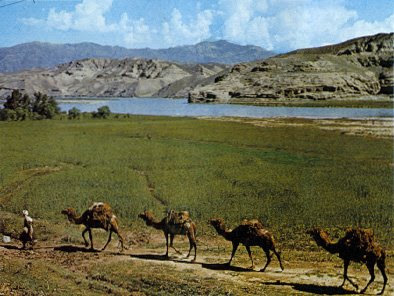 Ali describes it as " a small range lying to the the extreme west, between the districts of Herat and Badghis. Its local name is Siah Babuk.". Ludwig Adamec in his Historical Dictionary seems to agree with modern maps: He spells it Paropamisus and says" the name given by Western writers to the Safid Kuh and Band-i-Baba, the range bounding on the Hari Rud (q.v.) valley on the north." A number of cartographers, particualrly the Polish during the Soviet occupation, leave the name off the map altogether and stick to the more specific ranges, the Safid Koh and Band-i-Baba. The Paropamisus is specatcular when driving from Qala-i-Nau to Herat. It takes on the appearance of the Italian Dolomites with it sheer-sided pinnacles. The Sabzak Pass is the main pass and is usually cut off in the winter. This impressive range forms a mountain border between southern Fariab and Sar-e pol and the northern border for Badghis and Ghor provinces with peaks reaching up to 4161 metres. 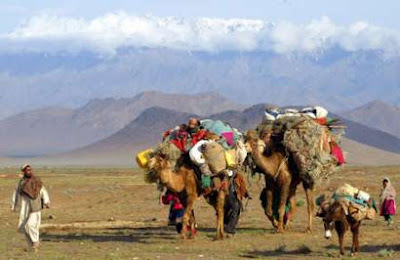 Approached from the north, the Turband -i-Turkestan breaks the lunar-like landscape of Fariab province by providing a stately-white mountain range that dominates the high south-ern horizon. A number of villages at altitudes of 2000 metres are inhabited by mountain Tajiks who plough and plant the treeless mountainsides with a hardy variety of wheat. Pockets of Hazara and Uzbeks families also live in the villages at slightly lesser altitudes. The Tur-band-i-Turkestan is frequently racked by earthquakes, and is situated on an active faultline. At its eastern extermity an outlying range, the Hesar mountains run south easterly where the bor-ders of Ghor, Sar-e-pol meet Bamian province. The highest point of this range is 4539 m.
Lowell Thomas writes about the early history of the geography. "The source of the Nile and the location of the Mountains of the Moon were two of the earliest geographical enigmas. Both puzzles lasted into the nineteenth century, for not until central Africa had been penetrated and mapped did it become possible to solve them. ..... In the second century AD., Ptolemy, with the accumulated wisdom of the astronomer, mathematician and geographer, was more positive.In the fourth century BC., Alexander the Great had consulted the oracle of Jupiter (Amen-Ra) in the Siwa oasis of Egypt about the success of his expedition into the East-and about the sources of the Nile (which he thought he had found in the Hindu Kush mountains of Asia, near the headwaters of the Indus River. It's a wonder Alexander knew where he was at the time, because he referred to the Hindu Kush as the Caucasus. On later maps they were referred to as the Indicus Caucasus. Probably, "Caucasus" was bandied about in the same way the name "Alps" is to-day, Aristotle further confused the issue by calling the Hindu Kush the Asiatic Parnassus. According to Babur, founder of the Mogul Empire, Hindu Kush means "Dead Hindu." Today we render it "Hindu Death." Possibly the most photographed mountain range in Afghanistan for from most parts of Kabul the north-west skyline is dominated by Kohi Paghman, a jagged range with summits reaching almost 5000 metres. Kohi Paghman forms part of Kohi Daman, Daman meaning skirt, a skirt of mountains that circle the north of Kabul. On a winter's day there is cannot be a more impressive capital city view in the world than standing in the mountain Lion capital Kabul, looking at the ring of mountains in all directions, the most prominent being Kohi Paghman. From the village of Paghman a main river valley leads up and forks, one valley leads into Parwan and thence, Bamian, (a well known packing route) the other into Wardak province. This was the favourite region of the first Mogul Emporer, Babur. Here he wrote his poems, held wine parties, visited friends and soaked in the beauty. This is an off shoot of the Sulaiman range. Sikkaram, its highest peak, is 15,600 feet.A magnificent range when cloaked with winter snow and from the air and ground it dominates the landscape of Nangahar provinces and acts as a divide between Nangahar, Lowgar and Paktia provinces. There is a discernable pass between the eastern Speengar and the connecting range, the Safed Koh, (not to be confused with the Safed Koh in the Parapomisus, which divides Nangahar province from Pakistan's Northwest Frontier Province. The Safed Koh curves from its predominent west-east direction to the north east as it descends down to and finishes at at the lengendary Khyber Pass. When flying from Jalalabad to Kabul's Bagram airport it is possible to see the Speengar and the Safed Koh to the south and to the north a craggy range running from Assadabad in Kunar province to near the town of Metarlam in Laghman province. The south-western end of the Kashmund range drops into the southern end of the Alingar valley which leads to the high peaks of Nuristan. Further westwards is the fertile Tagrab valley which has an impressive un-named twin peak with a spot height of 4420 , trees cling to its steep sides up to 3,500 m. In winter the twin summits look similar to New Zealand's magnificent ice peak, Mt Tasman and its lesser peak of Silberhorn. This range is the barrier between the Indus basin and the Helmand River. It starts in Paktia Province at the Shutur Gardan pass 11,200 feet and runs in a south-south-easterly direction where it takes on additional names, the Mangal and Jadran hills. The highest points reach up to 12,000 feet. It is likely the mountain range got its name from the Sulaiman Khel Ghilzais, the name of the tribe whose land it passes through. There is another range of this name which runs along the Baluchstan-Punjab border. The bones of thousands of over-ambitous conquerors and their followers lie strewn across the heights of the Hindu Kush as they tried to take Afghanistan, but few were able to hold the mountain lands for long as the Soviets found out in the 1980's. This current war, like so many earlier ones against Persian, British and Russian armies, will be decided in the mountain valleys and passes where fanatical warriors momentarily put aside tribal feuds and joined together, displaying a unique brand of mountain guerrilla warfare which is based on hawk-like instincts, circle, swoop and loot. The spoils of war provide important resources. Of all the mountain passes in Afghanistan, the Khyber pass has a long history of conquests and death. There are thousands of significant mountain passes dotted throughout the country and it is not possible to name them all. However, the important ones have been mentioned in this article already. 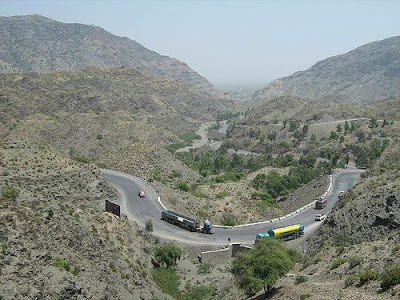 The road winds up to the Khyber Pass, Landi Khotal and Torkham. "The fabled Khyber cuts through the mountains south of the Hindu Kush, west of the Pamir Knot, connects the northern frontier of West Pakistan with Afghanistan, and links Turkestan in Central Asia with the subcontinent of Hindustan." Afghanistan and the Khyber Pass became the nineteenth century's legendary Northwest Frontier, patrolled by British military units like the Bengal Lancers. Campaigning through the "hills," their deeds of glory provided colorful material for Rudyard Kipling. In his "Arithmetic on the Frontier," Kipling paid tribute to the price paid by those early "few" with slightly racist overtones, not uncommon of that ear. 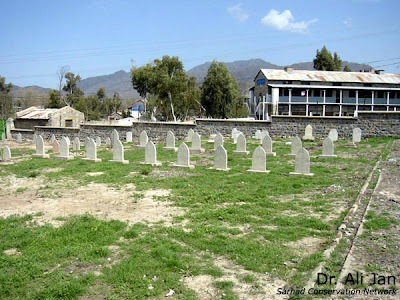 : "
A reminder of the huge loss of life can be seen today, when you head towards the Khyber Pass you pass the Landi Kotal Cemetery where soldiers of the British Army, mainly from 1879-80 (Second Afghan War) and 1898 and 1919 (Third Afghan War), are buried. Many regiments and battalions are represented here. Two stone obelisks stand in the middle each bearing a plaque. The inscription on one is almost faded and the other records: "Sacred to the memory of the British soldiers of all ranks who lie buried near this spot 187 of whom died at Landi Kotal from the result of wounds received in action and from disease during the Afghan Campaign of 1879-80 and the remainder since the reoccupation of the Khyber in 1898"
Wherever you are in Afghanistan it is impossible to escape the influence of the mountains. The success of crops depends on adequate winter snows, millions of sheep, goat and cattle rely on the lush summer alpine grazing for their survival, the country's economy depends on the gemstones lodged in deep mountain recesses, transportation is reliant on the condition of the alpine passes, avalanches, spring snow melt and the resultant floods can wipe out a village and its total crops with a flick of its icy tail. And, with the heavy deforestation and overgrazing up to the snowline all year round, local eco-systems and the biodiversity have been so impacted that the mountain habitat is degrading so quickly that landslides, flooding from bursting natural dams caused by blocked rivers, have wreaked havoc in mountain regions. Local mountain inhabitants complain that changing weather patterns are affecting their lifestyle. The result is a major ecological disaster occuring in the Hindu Kush. Labels: Mountain ranges of Afghanistan. There was the euphoria of Barack Obama's stunning victory twelve days ago, and the depressing result of our elections last Saturday with a frightening bunch of right-wing politicians set to govern the country. If you look at their individual track records of racist slurs, anti resource management act comments and lack of understanding of climate change just to quote a few,it concerns me greatly. I have been reading Robb's and Pete's blogs and comments and feel we have to look beyond our shores for the hope, moral and bold leadership that Obama is likely to bring. A man, who as a boy walked the streets of Jakarta amongst the poor, will not forget the damage money hungry people people like Keys, Dunne and Douglas have done. His roots are from Africa and he will not turn his back on the damage wrought be centuries of colonial exploitaion, such as slavery and genocide. I have been searching for the complete story on the challenges Obama faces. This was published in The Times overnight and is the best I have read to date. Thanks to Gerard Baker for his astute analysis. What do we do now?” asks Robert Redford, at the end of The Candidate, after his morally corrosive election campaign has left him successful but devoid of principles or agenda. There's no chance Barack Obama will find himself asking his advisers this question in the next few weeks. Seldom in the past 50 years can there have been a presidential transition freighted with the sort of policy challenges this one carries. Candidates generally run for office on one list of issues and then quickly find once in power that there's a whole lot more urgent stuff they have to deal with. Mr Obama began his campaign two years ago thinking that Iraq and healthcare would be his two main priorities as president. Now, even before he takes office, Iraq has - mercifully - lost most of its immediate sting, and healthcare is in danger of being overwhelmed in the storm of crises that awaits. A brief to-do list includes a succession of pressing tasks, any one of which would be heroic in scale: economic stimulus; financial stabilisation; averting the collapse of the American motor industry; saving global trade; reversing the tide in Afghanistan. If you add to that the likelihood that, within his first term, he will have to make a pivotal decision about Iran's nuclear capability and will continue waging a global war on Islamist terrorism, you get a sense of the scale. Bill Clinton used to worry to his advisers that he couldn't ever achieve true greatness because there were no big challenges any more. He should have been so lucky. Much - way too much - has already been written about Senator Obama's capabilities. The one thing we can say with certainty is this: if he can somehow navigate the US safely and prosperously through the swirling currents of the next four years he will really have a claim to greatness. So Washington is agog with anticipation about the arrival of the new president. But Washington being what it is, the immediate focus of frenzied concern doesn't involve tax cuts or bailouts or sit-downs with foreign leaders. It is the critical decision that will bring euphoria to some and break the hearts of others: where the Obama daughters will go to school. I've long thought that there's a certain type of parent in Washington that rears children solely for the same reason they do everything else: to move upward in society. They would literally kill to get Nelson Jr into a particular school in the hope that it might be an entrée to some important contact. True happiness for many in this city is the possibility that little Meredith will play on the same soccer team as the daughter of the Deputy Assistant Secretary for Administrative Affairs, or if fortune is really smiling, some glamorous White House correspondent for one of the networks. Now suddenly the prospect that their daughter might find herself in the same class as Sasha or Malia Obama - the White House Birthday Party! The Camp David Sleepover! - is, quite simply, going to drive a lot of people insane. This weekend there are thousands of wealthy Washingtonians clinging to the Audacity of Hope that their school will be selected. Many more will flood the lucky academy next year with admission applications. The city's proudest lawyers will plead with administrative assistants for reconsideration. There will be attempts at bribery. There will be blood. When he and Michelle have finished disappointing a sizeable number of the capital city's parents, President-elect Obama will have to turn to the business at hand. The times and circumstances of his election call not for a sharp ideological turn but for pragmatism. We trust you to do what works, was the message from the voters. The early evidence is encouraging. The selection of Rahm Emanuel as White House chief of staff is intriguing. Mr Emanuel is as sharp an operator - in every sense of the term - as anyone in this city of flick-knife-wielding political assassins. His managerial style is famous. He is to the courtesies of polite society what Sweeney Todd was to the short back and sides. He is known for using a familiar Anglo-Saxon expletive in conversation as a convenient all-purpose verbal utility vehicle: noun, verb, adjective, adverb, participle, gerund, whatever. But he is a cold-eyed pragmatist who masterminded the triumph of the Democrats in the 2006 midterm elections - a victory built on the selection of candidates who were notably centrist in their outlook. Whatever egalitarian sensibilities he may have had about economics and financial markets were presumably softened by his period as an investment banker, when he is alleged to have made $16 million in less than two years. On economics, that suggests that President Obama intends to do what works. That will probably involve a mix of the middle-class tax cuts he promised and some targeted spending increases. But it could well go farther. His economic advisers are understood to be urging him to be bold, as the current crisis demands. A trillion-dollar budget deficit is not beyond the bounds of possibility. He will, if he is as wise as he seems, drop the quasi-protectionist rhetoric that might have sounded good in a campaign but will surely turn recession into global depression if implemented as policy. Abroad, the new president will surely seek to make good on his promise to repair America's standing in the world. But he and his advisers know too that much of the damage was done in the first four years of the Bush Administration. The next four years of Obama foreign policy are not likely to be all that much of a breach with the more cautious and co-operative past four years. One early decision will have to be made on the future of Guantanamo Bay. The President-elect is already being advised on the legal and security complications of making good on his pledge to close it. But he knows its symbolism as a blight on America's reputation. Closing it might well prove to be not only the ideologically pure thing to do but also the pragmatic way to rebuild America's reputation. The biggest political challenge is going to be how to alternately please and restrain a Democratic-controlled Congress. There's a danger and an opportunity in this. The danger is he gets pushed by them towards policies that might be unpopular. The opportunity is that he can, on occasions, stand up to their demands and win credit for his toughness - something President Bush never seemed able to do. The Obama era will open with high expectations and high hurdles for success. The first task for the new president will be to bring both down to scalable levels. Kuchi or Kachchi nomads: India, Afghanistan and beyond. When I was a boy I used to have similar dreams at least twice a week for years, probably for eight or more years. I was with a group of nomads with camels, horses, sheep, goats and some cows. It was on quite a dryish area and there were stunning snow capped mountains as a backdrop. Later when I went to Central Asia I saw the backdrop to my dreams, the steppes and the mighty Tienshan mountains of Kazakhstan and Kyrgyzstan. I married a Kazakh woman who was born on those very steppes of my dream, on the border of China and Kazakhstan. Grand Mum still lives in that village, and at 90 still tends her sheep, grows a great garden, and bakes her nan in an oven outside, a tandori. So my friends, childhood dreams can come true. I have always been fascinated by nomads. In late 1993 when I moved to Afghanistan for 3 years, I started taking a deep interest in Kuchi nomads and over the years traced their roots and routes to Central Asia, Kachchh district in Gujarat, India, and places beyond. A map of Gujarat showing the Rann of Kachchh where the Kachchhi nomads live and graze and nmove to the fringes when fodder is scarce. I quote from my diary in June 1995. One of the memorable aspects of this trip was our contact with Kuchi (nomads). On our way up the Panjsher valley on 3 June 1995, our way on the narrow dirt road was constantly blocked by up to 50 Kuchi extended families moving their livestock - camels, goats, sheep, donkeys and horses - to higher pastures for grazing. Most of the Kuchi we saw were in the area from Rokhah to the road pass of Rawat. Their black, low-slung tents, made from goat hair, were dotted all up the valley. They tend to go in large extended family groups with one of the men leading heavily laden camels, between, 2 to 5, carrying tents, pots, water jars, bedding, firewood and materials to trade etc. The men were dressed in the way of normal Afghans but the women were conspicuously different. First of all the striking colour of the baggy trousers, either dark green and a red, near maroon red top/dress over the trousers. The head scarf was usually a bright colour. The younger women, under 30, had their hair parted in the middle and broaches/hair clasps on the fringes. Facial tatoos were noted on all women, probably done at or around puberty. In most women seen, they had tatoos on either cheek, sometime one on the chin and forehead. Young girls seemed to all have dark black hair cut in the page boy style. Eyes very large and striking, ranging from the predominent dark brown to a few with blue eyes. They cared well for their animals. Young goats were in the tents being protected from the elements, women tenderly carrying lambs in their arms, an old sheep, probably lame, riding on the back of a camel. The camels were usually adorned with colourful braids, goats had bells on their necks and the donkeys carrying saddle bags. Babies and young children were tied on to backs of camels or donkeys and wore intricately embroidered hats/bonnets. The children seem so content sitting on the backs and thrive on their mobile geography lessons. The children and young women seem to be gatherers of wood, berries, leaves, wild vegeta-bles, powdered lime/rock. Carpet making is clearly an activity. Ian saw one women making a kilm runner. One old man was preparing wool from a sheep skin. The above is merely from observations on the trip. 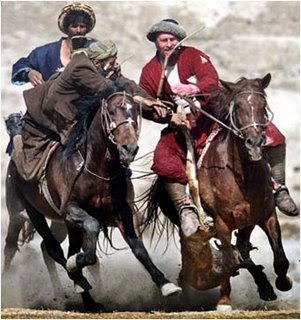 "Before the war started in 1979, it was estimated that about two million Afghans are either fully nomadic or semi nomadic, and an increasing number of these two types join the already numeropus semi-sedentary groups. These are herdsmen who move as a group from summer to winter pasturages and back again. 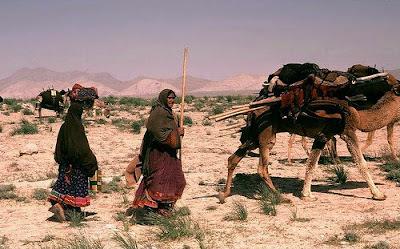 Most nomads are either Pashtun, Baluch, or Kirghiz. The Pashtun and Baluch move more horizonatlly than vertically; but the Kirghiz in the Pamir Mountains move more vertically than horizontally." It is likely that the nomads we saw were mainly Ghilzai, Eastern Pashtuns. Actually, the nomads have a functional symbiotic relations with the villagers along the routes from grassland to grassland. Sheep and goats supply meat, dairy products, wool for clothing, rugs (Khilms) and goat hair for tents. Nomads often trade these items for grains, vegetables, fruit, and nuts, and although cash exchanges increase every year, barter is still common when the migration routes leave the modern lines of communication. Trade items (tea, sugar, kerosene, matches, guns, ammunition etc.) are offered to villagers by the nomads; itinerant peddlers function only where the nomads do not control the monopoly. Animal dung, a primary source of fuel and fertilizer, is liberally spinkled on farmers' fields by the nomads flocks after harvesting. etc. Communications flow from region to region through the mouths of nomads... the nomads also serve, contrary to popular belief, as the maintainers and perpetuators of marginal grasslands. 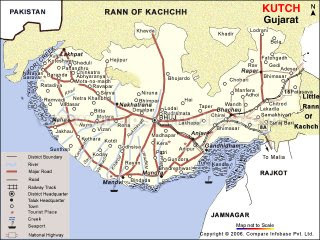 When you delve deeper into where the word Kuchi came from, it is from Kachchh, the far western corner of India in the north of Gujarat. Tejinder Singh Randhawa an authority on the Kachchhi people says in his book., " Katchchh has been a significant confluence point for different races and people. The nomadic pastoralists are certainly the most interesting and their links can be traced on one side to the Marwar and Mewar (regions of Rajasthan, Saurasht and, on the other side, Sindh and beyond to Afghanistan, Iran and Central Asia." I lived in Bhuj, during the Gujarat Earthquake in 2001 and spent a lot of time with Kachchhi people and the similarities in dress, embroidery, pastoral nomadic life were so similar. I studied the embriodery closely and compared it with the Kuchi nomads in Afghanistan. Virtually identical. The similarities were astounding. I would like to quote my my good friend Bernard Dupainge, Ditrector of the Museum on Man in Paris. His words on embroidery are revealing about culture.
" The richness of its history, the diversity of the landscape, everything inspires to make Afghanistan a stronghold of traditions and art forms. Each valley has its own cultural identity, it own orininality. In a country where the main route of communications were overrun by invaders, the mountaineers turned in on themselves. Access was difficult and uncertain, the valleys isolated." As Louis Depree says earlier in my piece, that the nomads traded, bartered and influenced culture. Embroidery would have been traded, and of course copied. Hence similar embroidery a thousand miles or more apart. 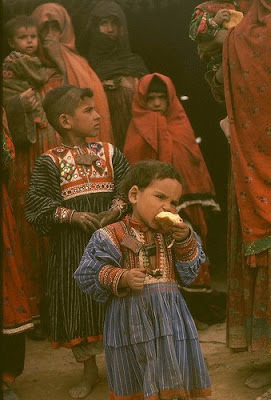 Kuchi children in Afghanistan. The embroidered shirts on these Afghan Kuchis are almost identical to the designs i saw in Katchchh district, Gujarat, India. 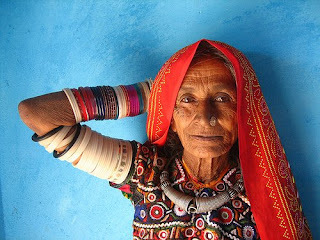 The largest group in Katchchh district in India are the Rabari who are Hindu cattle herders and shepherds. The other main group of pastoralists are consist of two dozen nomadic or semi-nomadic Muslim groups who trace their roots from Sindh and beyond. The Jath are the largest of the group. 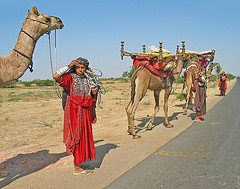 Kachchhi nomads near Bhuj in Gujarat India with their camels. One man lives penniless in a field under a patchwork tent with baying dogs roaming outside. Another, wearing a suit jacket and tie, glides past his silver Mercedes as he welcomes guests into his plush Kabul villa. Both are Kuchis, which means "nomads" in Pashtu language. Yet they have little in common, except their shared heritage and the view that the life of Afghanistan's wandering peoples is fading. Few of the itinerant tribesmen have settled down and prospered. For the majority, life has been pushed to the brink by poverty, war, shrinking access to land, ethnic tensions and leftover land mines. "We are the last of the true Kuchis, but because of the hardships we are fed up with this life," said Fugal Khan, a 50-year-old Kuchi who has hit the road with his family and five others, heading for higher country to beat the coming summer heat. Officials estimate there are about three million Kuchis among the 25 million or so Afghans, with about 60 per cent of them still following the nomadic life. They are among the poorest of the battered country's poor, owning little more than a tent and a few sheep and cows. For more than 3,000 years, Kuchis were Afghanistan's pre-eminent transporters and traders, serving as a mobile bridge between South Asia and the Middle East. But now Kuchis like Khan, who recently arrived on Kabul's outskirts after walking 100 kilometres from eastern Laghman province, are a largely forgotten people, neglected by government. Armed villagers and warlords often chase them off the land guaranteed to them under the new constitution. Hospitals refuse their sick, and graveyards reject their dead. They earn money by selling milk from their animals, but many also make their children work or beg. Even if they wanted to settle down, most couldn't afford to buy or rent a house. Yet not all Kuchis share the same lot. Some have bought property and use it as a base to return to after several months of travel. And there is a smaller, more affluent group that settled down long ago, leaving the roaming lifestyle behind. Hashmat Ghani Ahmadzai, chief of the Grand Council of Kuchis, is among the wealthiest and most influential Kuchis, thanks to a large family inheritance based on land ownership as well as a successful transport company. He is also a vice president of an American security and reconstruction company. As chief of the Kuchi council, which represents the interests of largely settled Kuchi tribes, Ahmadzai deals with important Afghan politicians, including President Hamid Karzai. But he says ideas he has put forward to improve life for the poorest nomads, such as providing community centres and integrating them into settled societies, aren't being taken up. "Nomadic life is coming to an end. Ninety-eight per cent of the Kuchi lifestyle has changed," Ahmadzai said, sitting in his luxurious Kabul home filled with deep red Afghan rugs and dark brown lacquered tables. "The grazing land is not there, transportation and trade has changed so much. Kuchis are not needed." Kuchis played a key role in Afghanistan's post-Taliban political revival, throwing their support behind Karzai in 2005 presidential elections. The nomads' most influential figure, Naim Kuchi, was detained by U.S. forces in early 2003 for being a Taliban commander, then freed in late 2004. Karzai feted him on his return, a gesture many Afghans believe was aimed at courting Kuchi support at the ballot. Ten of the 249 seats in Afghanistan's parliament have been allotted to Kuchis, but many are filled by people who aren't nomads because few actual Kuchis stepped forward to contest the election. Kuchis were also promised a government department to handle their affairs, but it never materialized. Shahbuz Ahmadzai, a prominent tribal leader hand-picked by Karzai to advise him on Kuchi and tribal affairs, accuses the government of doing nothing to help nomads. "Kuchis have the hardest life of all Afghans. These people have no possibilities even after giving their vote to President Karzai," he said. "If my advice keeps being ignored and I continue to be disappointed I will resign." 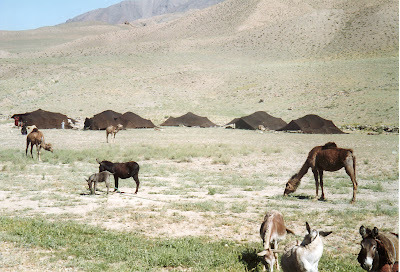 Nomadic life on Afghanistan's high plains has become more dangerous amid the proliferation of weapons and scattering of land mines, particularly during the mujahedeen uprising against the 1979-89 Soviet occupation and the ensuing four-year war to topple a communist government. "Before the revolution, we Kuchis had a very good life and were free to use huge areas of desert," said Alim Jan, a 45-year-old nomad. "But things changed with the war between the communists and the mujahedeen. Everyone took up guns and nobody now listens to the government. Now when we enter the desert, men approach us with guns and say: 'Go away, Kuchis.' "
This is just a snippet of information I have gathered on Kuchi or Katchchh nomads and would appreciate feedback on those who probably know more than me. They are rarely written about.. Next article I would like to elaborate on the embroidery of Afghanistan. Labels: Kuchi or Kachchi nomads.